Pattern includes directions for a sacque, diaper and blanket. 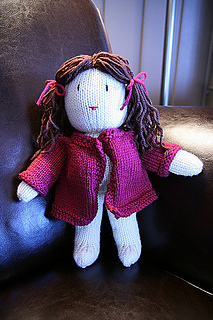 The doll and her accessories can be made in any worsted weight or DK yarn, but she will be a smaller size. Yardage listed is for the doll alone. You will also need yarn scraps for the embroidered features and some craft fur for the hair.